Today my girls had their first day of school! The summer flew by this year. It seems like they just got out but they were all 3 super excited to go back! Which makes it much easier on Momma. 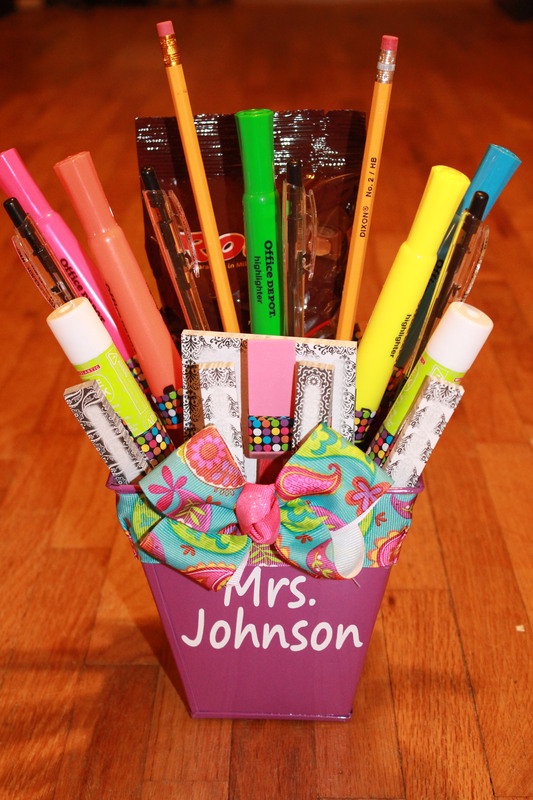 I’ve been thinking about doing a school supply bouquet for a teacher gift for a while but just never sat down and tried it. Until now. 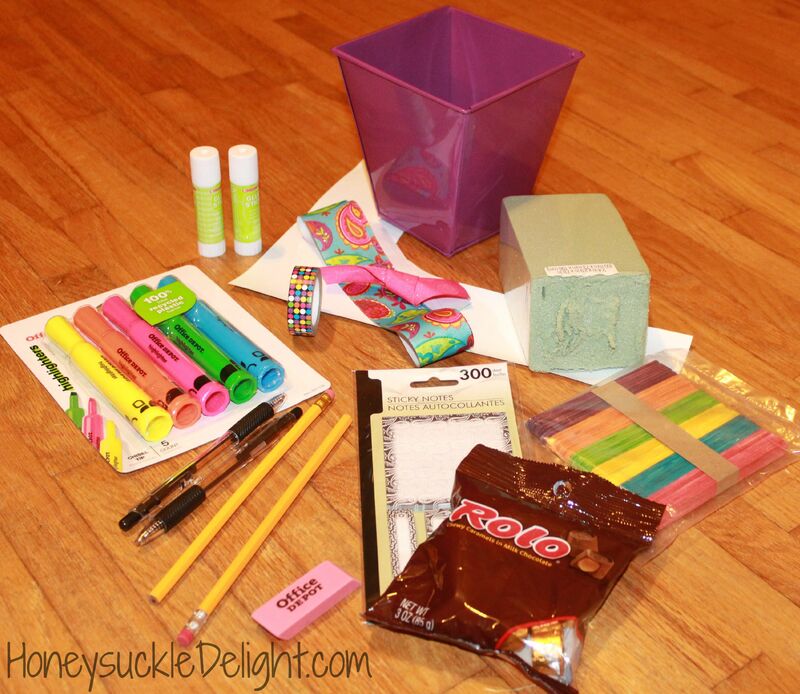 Because what better gift to give the teachers on the first day than new school supplies? It was also so much easier than I thought it was going to be. Which is always a plus. I see many more of these bouquet gifts in the future! 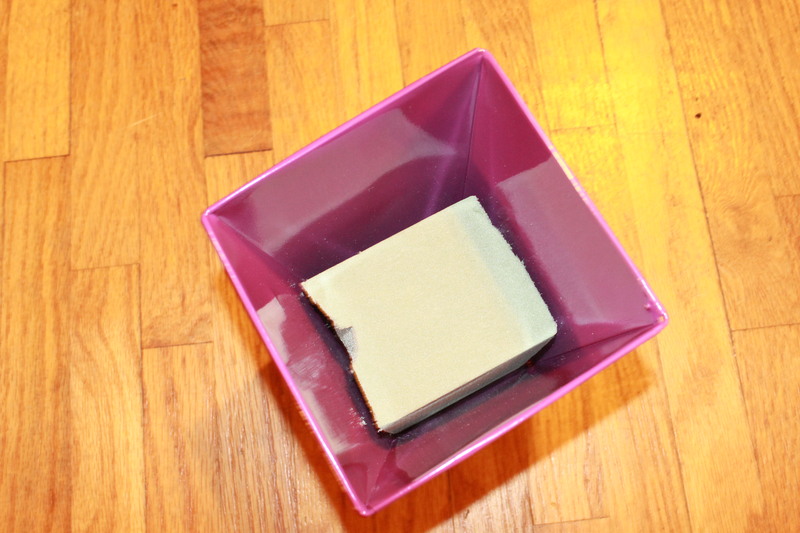 Start by cutting your foam to fit in the bottom of your bucket. 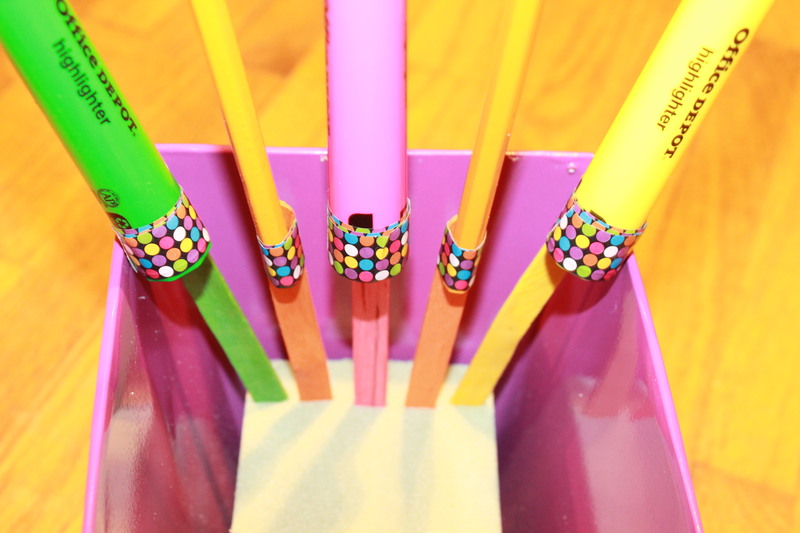 Then using the glue gun, glue this in the bottom. Use plenty of glue. This is going to hold all of your supplies and needs to be very sturdy or it will come out. While your glue is setting on your foam and before you start adding in your supplies, add your ribbon, bow and any decorations you want on your bucket. Now it’s time to personalize. I used my cricut and vinyl but if you don’t have that available, Hobby Lobby and Michaels have really cute stickers that could be used instead. Now take your popsicle sticks. I found these colored ones at the dollar tree. Using your scissors, cut the bottom so there is a point. 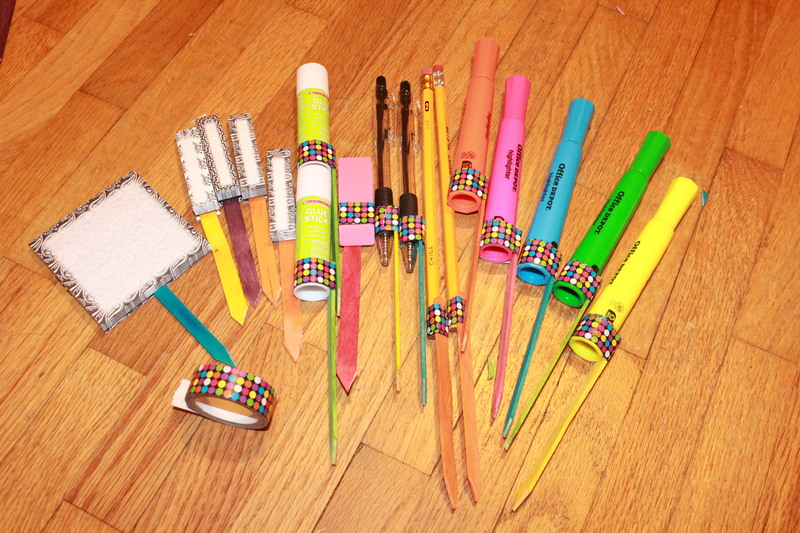 Using the tape, tape the popsicle sticks on each piece with the pointed end down. You could also use BBQ Skewers here instead. Now for the fun part! Adding all the school supplies. Just push them in far enough they won’t go anywhere. The girl’s teachers loved them! And they were super proud to give them a gift on the first day of school too. This gift only cost me around $5 thanks to the amazing deals we have here for back to school sales! Would love to see your finished project if you make one! 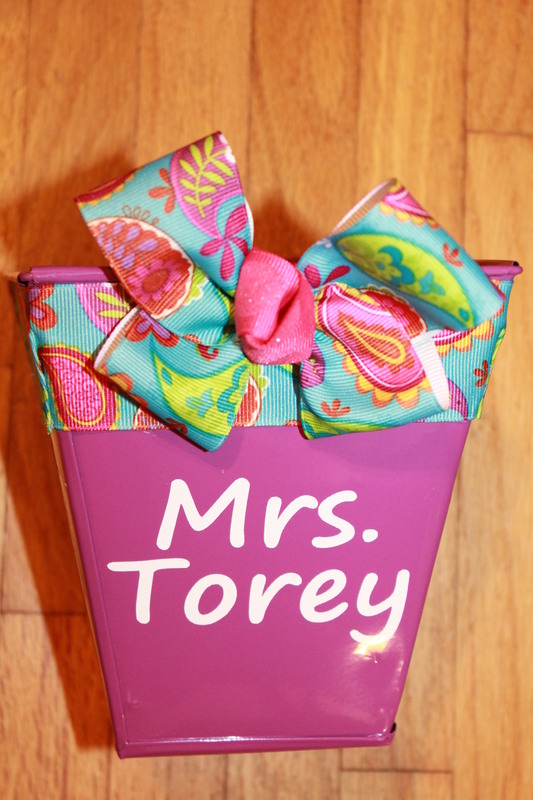 This entry was posted in Mother's Day, Teacher Gift and tagged Cricut, First Day of School, Gifts Under $5, Personalized Gift, School Supply Bouquet, Teacher Gift, Vinyl. Every time I need a wedding gift, this is one of the things I make first. 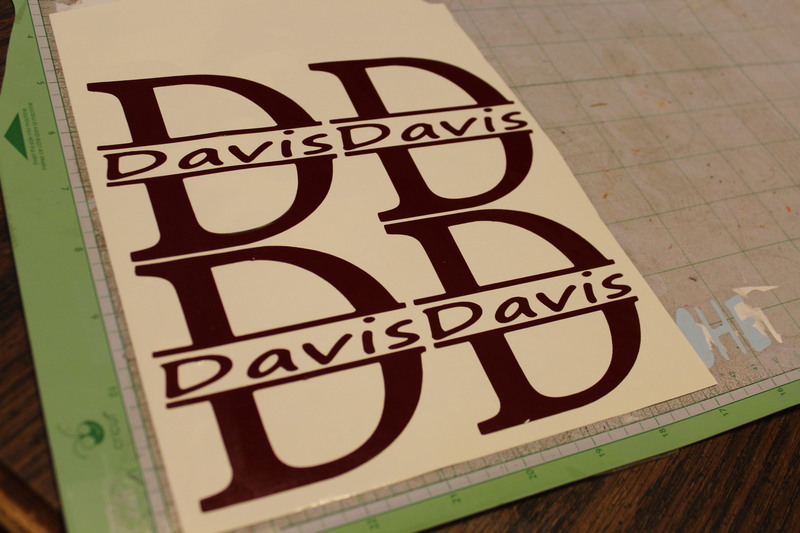 Monogramming everything is the craze these days, but just think about how even more exciting it is to have your new last name on everything right when you get married! 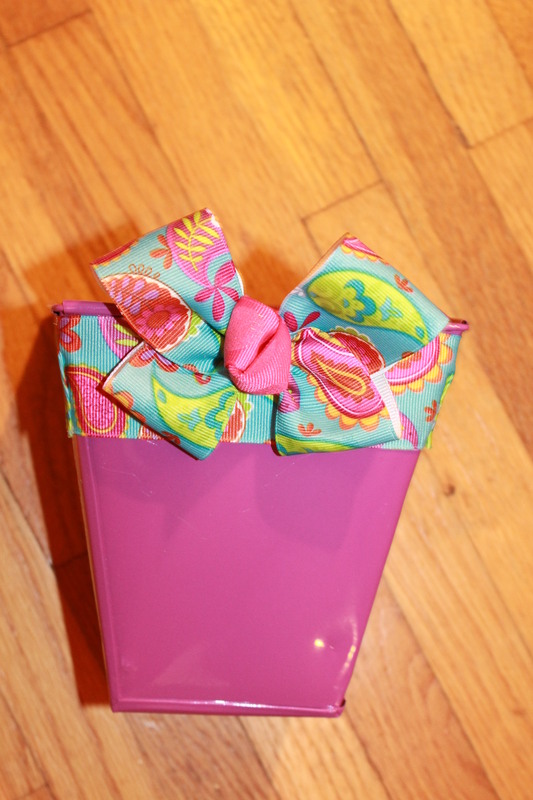 This super easy craft is also good for any gift not just weddings. I have a friend that has me make them for her every Christmas for her kid’s teachers. I even made them for myself and still love them! Now carefully peel off each name using the contact paper. Then transfer it to the top of the coaster. These letters were almost as big as the coaster so it was fairly easy to get them straight. 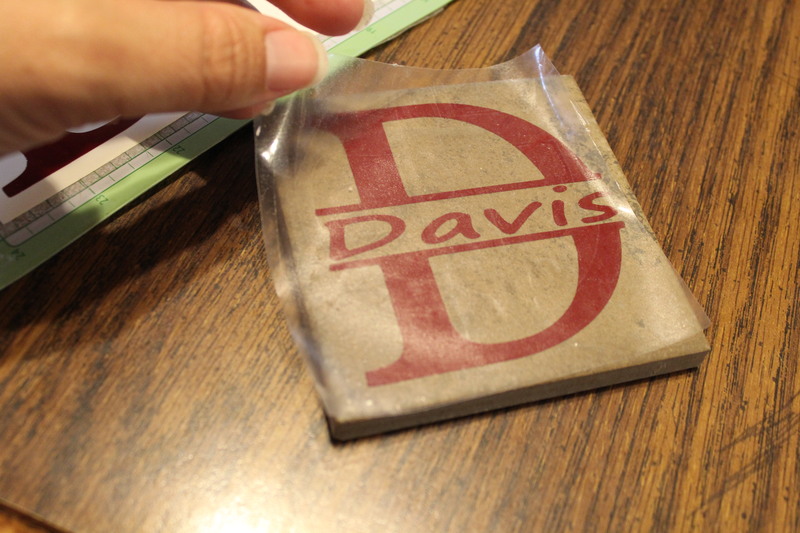 Once you are done with the vinyl you are ready to start putting the cork on the bottoms. I got my roll of cork in the aisle with the contact paper at Home Depot. I know they also have this at Lowe’s and Walmart. But in my experience it is always really close to the same price. 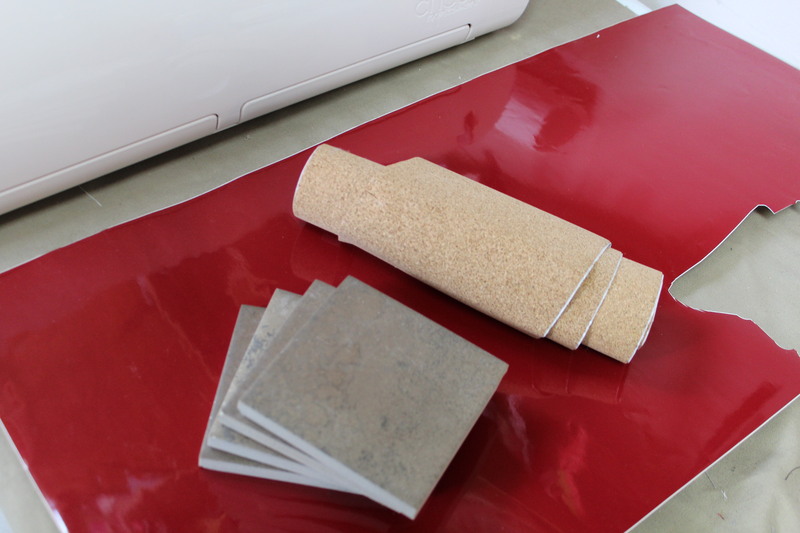 Start by measuring and cutting the cork the same size as the tile. 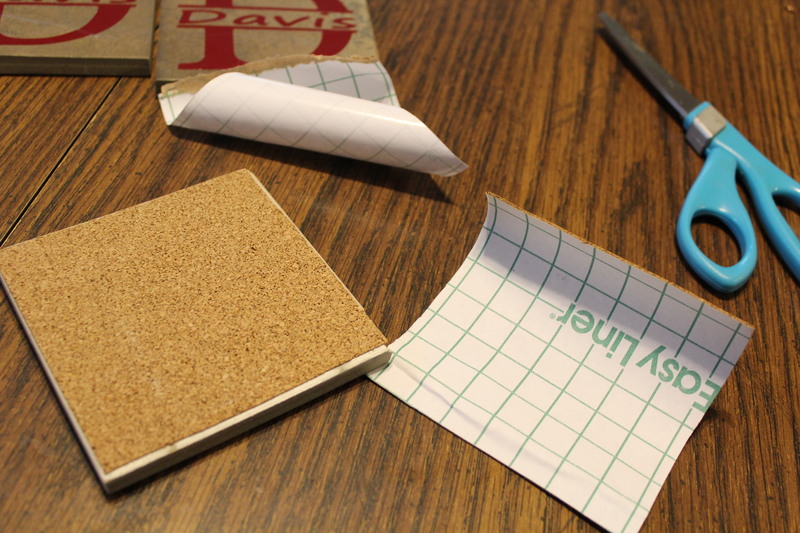 Then fold back one corner of the cork and line up the rest with the bottom of the tile. Push the corner down that you folded the backing on and carefully peel the rest of the backing off pressing as you go. Sometimes if I didn’t cut straight I will go back and cut off the excess so it’s not showing from the top. 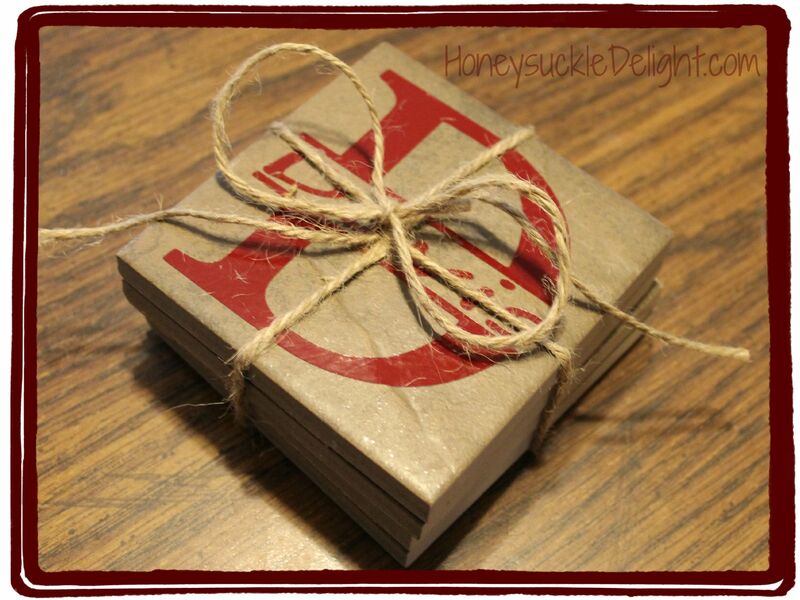 Now stack them all up and tie them together with twine or ribbon. This wedding was a country theme so I thought the twine fit well. If I am making it for Christmas gifts, I like to tie it with Christmas ribbon. 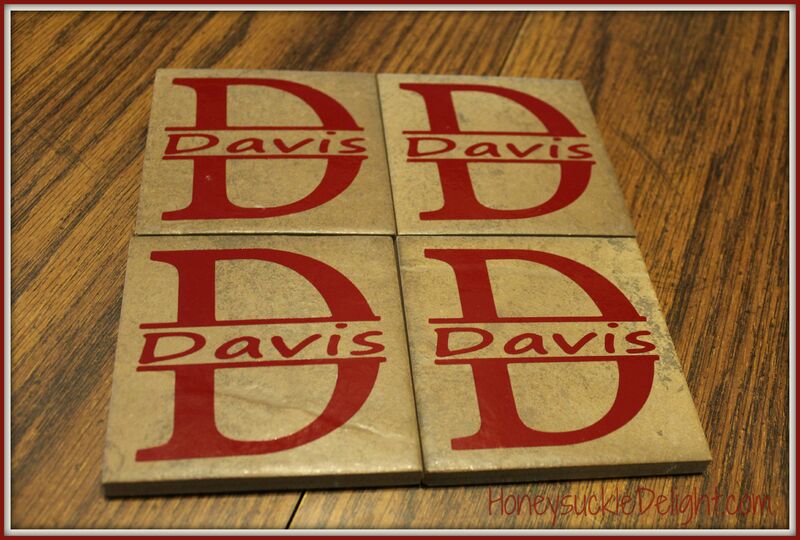 This entry was posted in Crafts, Vinyl and tagged Christmas Gift, Coasters, Craft, Cricut, DIY, Personalized Coasters, Personalized Gift, Teacher Gift, Vinyl, Wedding Gift. I have looked and looked for the perfect chore chart. We tried the dry erase ones….but they always seemed to get erased and the girls got frustrated. Then Mommy got frustrated! So they went in the trash. Tried just printing them out. That wasn’t really working for us. So I decided I wanted something where we could change out chores as often as I wanted and would be easy. And cute of course! Here’s what I came up with. 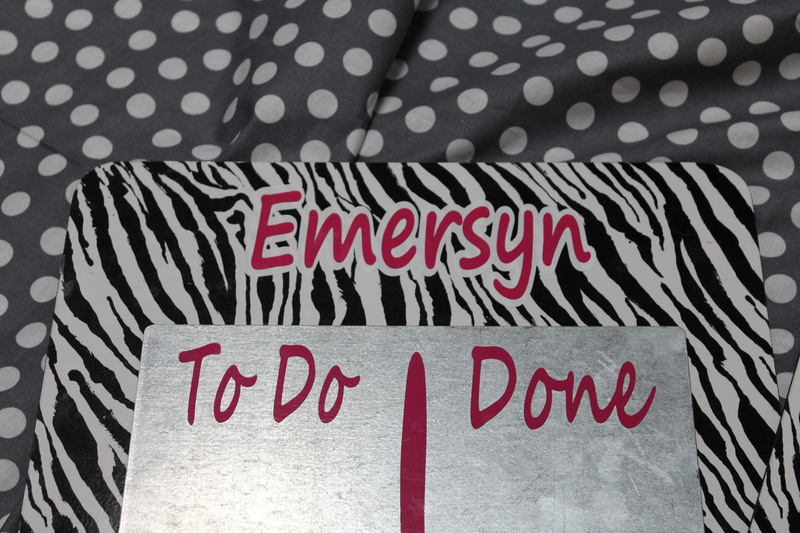 Board ( I found this zebra board in the serving supplies at Hobby Lobby. 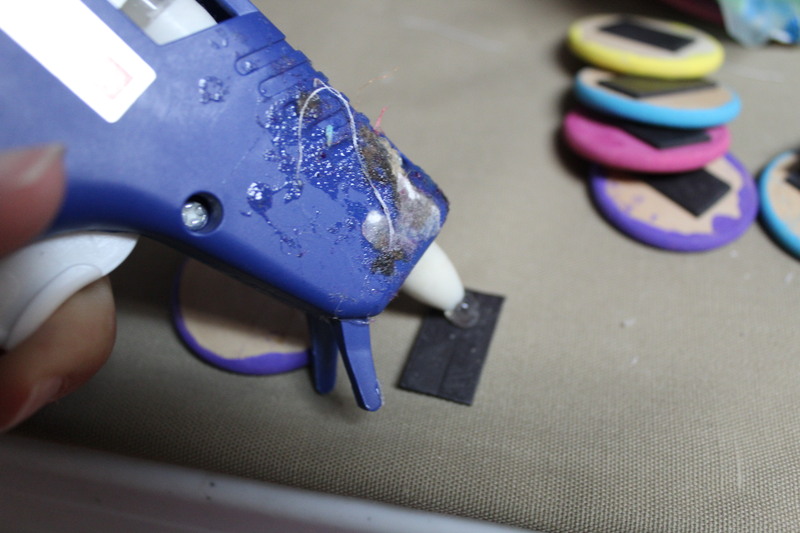 The first thing you need to do is glue your metal to your board using E6000. Leave extra room at the top so you can put a name on the top. I left 3.25″. Then just center the board from side to side. 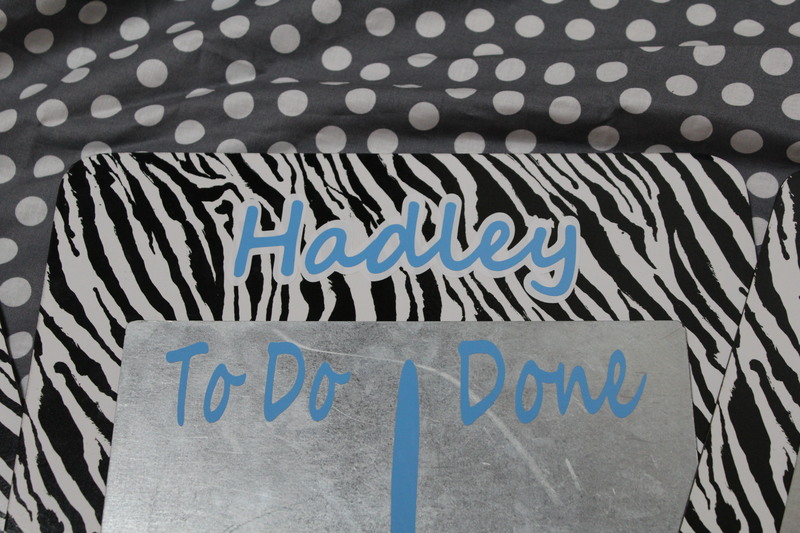 I then cut the names out using my cricut and their favorite color vinyl. I like to put the name on a solid background shadow when there is a busy background. So I used white for the shadows. The name measures 2.25″ x 6″ The font is called Segoe Script. I like this font for anything I want to look kiddish. 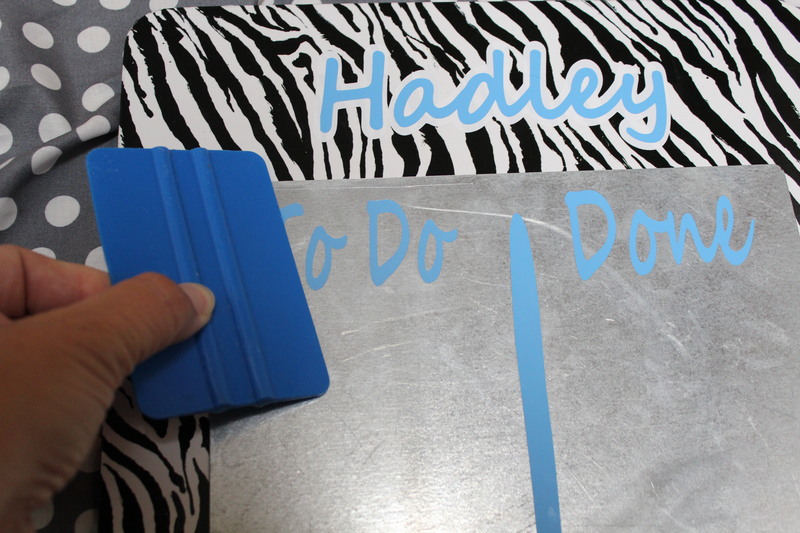 Then using the contact paper center the name on top of the shadow and then the entire piece onto the board. Cut out the words To Do (measured 1.5″ x 3″), Done (measured 1.5″ x 3″) & a line to divide. 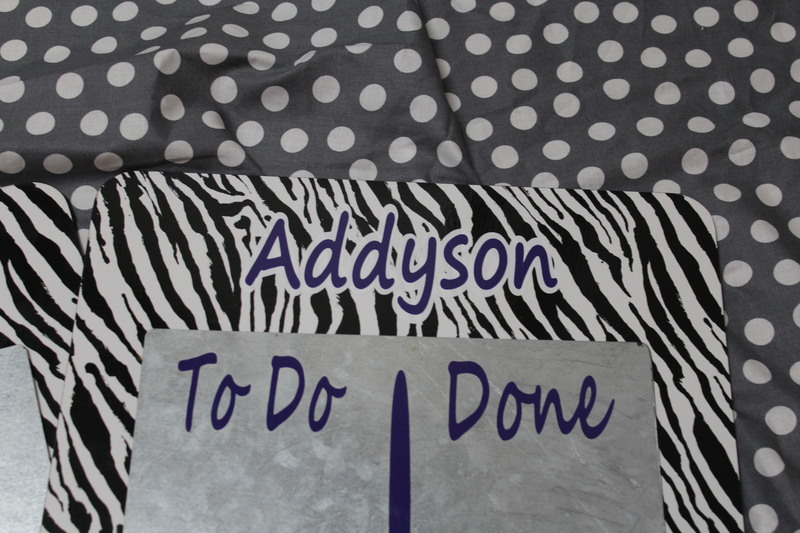 Then using contact paper, place the words. 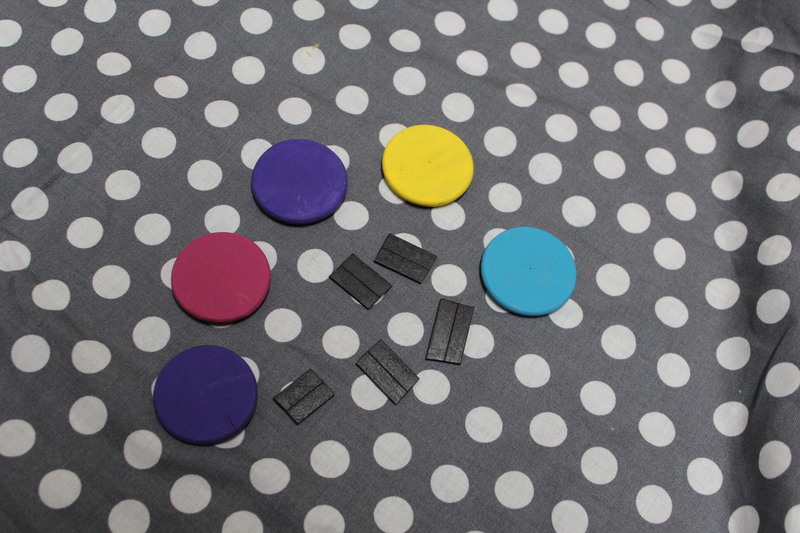 Paint your wooden circles and glue on the magnets. I got the sticky magnets thinking I would just use those. Don’t bother! Go ahead and use a glue gun to glue on the magnets. They will fall off if you don’t I promise! 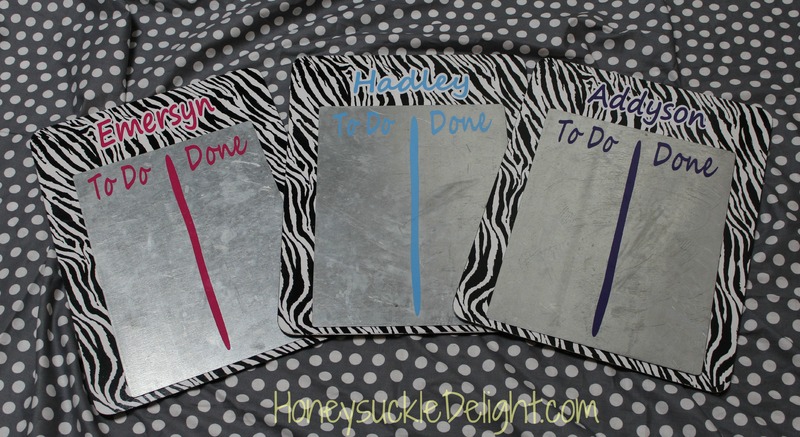 Now you’re ready to hang your chore charts and put your kiddos to work! I used the 3m Hangers that I got at Michaels. 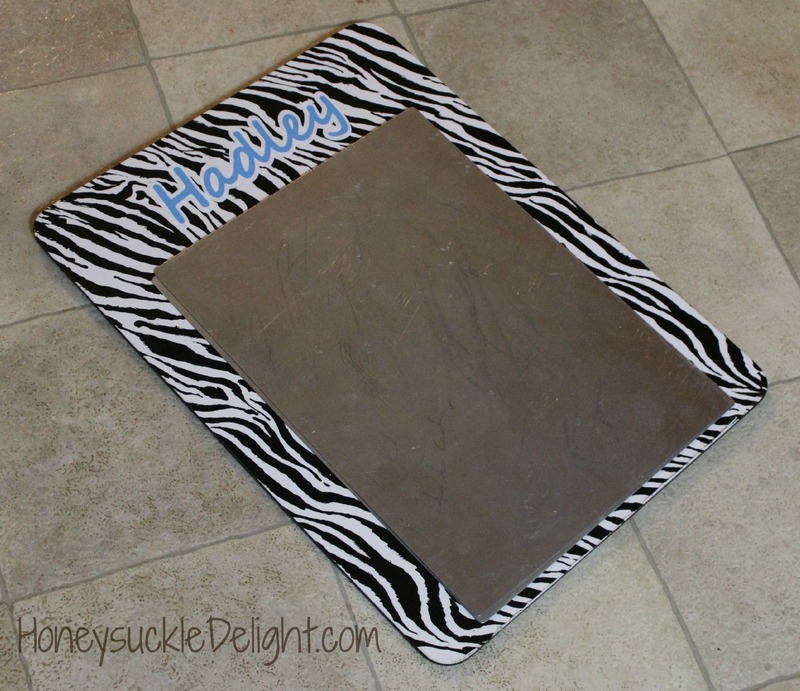 This entry was posted in Kids Crafts, Organizing, Vinyl and tagged Chore Chart, Cricut, Kids Chore Chart, Kids Chores, Kids To Do, Magnetic Board, Magnetic Chore Chart, Organizing, Vinyl. I was contacted a few days ago by a high school friend’s Mom for a Mother’s Day gift for her daughter. She sent me 2 pictures. Told me how she wanted to combine the ideas and she wondered if I could help her do it. I didn’t have to think twice. OF COURSE!! She did the hard part in my opinion! 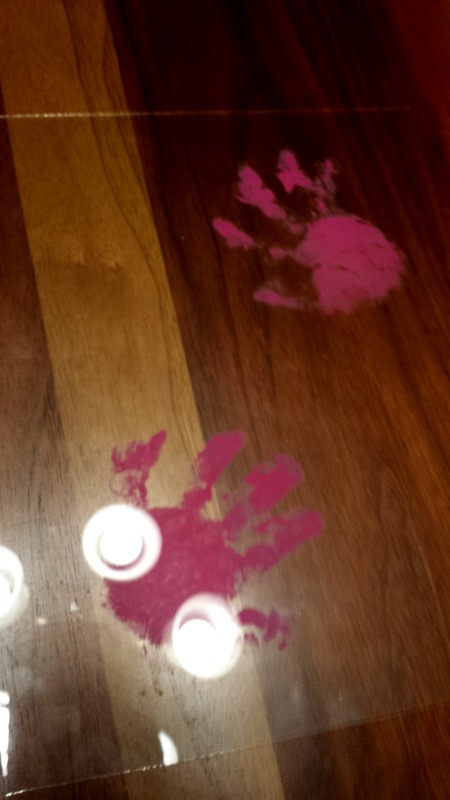 Lol she had to get her sweet one year old granddaughter’s handprint. Just dip their hand in the paint or paint it on there with a paintbrush. Just make sure you have plenty of baby wipes handy. I promise you will not do this in one try. But it will be well worth the hassle in the end! Place the hand prints on the back of the glass. You could also do it on the paper you intend to use as backing but placing the handprint on the glass will allow you to change the color of paper if you choose later on to match decor. Sorry for the glare! But you get the picture. Now get out your cricut and print out the saying. I used the font Tempus Sans ITC. The words measured a total of 9 x 6.25. This allowed just the right amount of space on each side in the 8 x 10 frame. Make sure to pay attention to your settings on your cricut or you will cut too deep like I did. Since it was only the heart and one o I was still able to make it work. Use your contact paper and transfer the vinyl onto the front of your glass. Cut your cardstock you plan to use for the background and you’re ready to go! 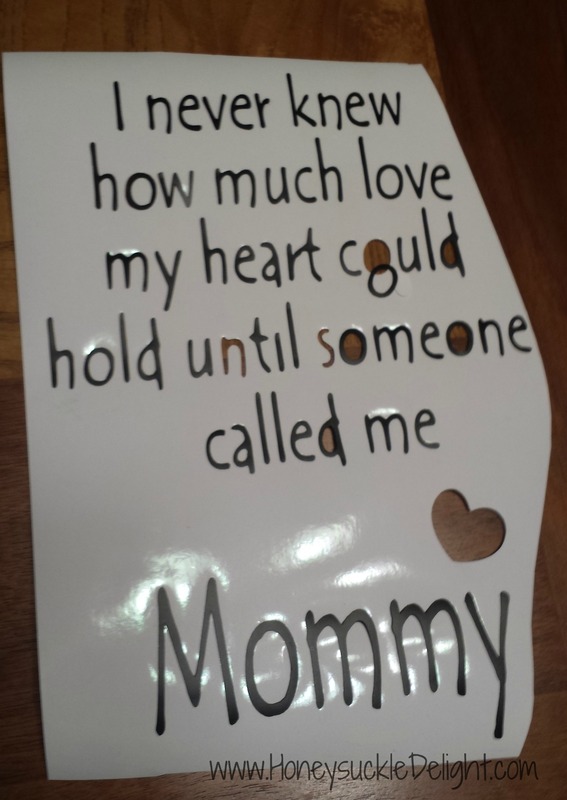 This entry was posted in Mother's Day, Vinyl and tagged Craft, Cricut, Gift, Hand Print, Mommy, Mothers Day, Picture Frame, SCAL, Vinyl. I must say my girls have the most awesome teacher this year. I am so very grateful for that! Just think about how much time and energy they all put into loving on and teaching our kids. The time that I am unable to be with my girls I am so thankful knowing they are still taken great care of. For that, I think anytime is a great time to say THANK YOU! 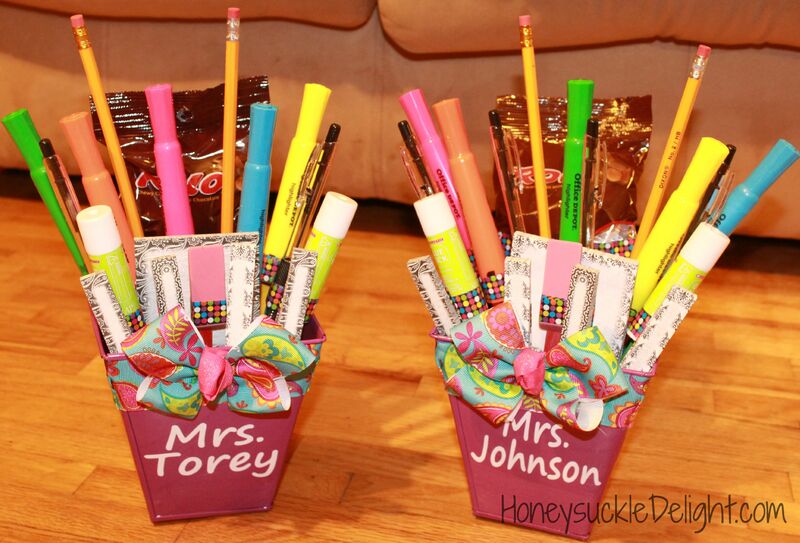 But since it is Teacher appreciation week, I figured this was the perfect time to give their teacher and the aide in their class a gift! So since vinyl is one of my favorite things, I made them each a cup and filled them with candy. Because who can’t use a cup and candy! Right? I use a program called Sure Cuts a Lot along with my cricut. If you don’t have that program, you could still use your cartridges to accomplish the same thing. But I’ll be honest I don’t know how to do the shadow without it. Start by typing your word for the saying. I used the font Segoe Print. It measures 3.61 x 3.22. The word TEACHER is a shadow blackout rounded. Make sure to group your words and then meld them so they will cut out together where they overlap. I cut out my saying and the teacher’s name in turquoise. Once it cuts, use your contact paper to transfer onto your cup. Press down hard to get out all the bubbles before you pull off the contact paper. I used white for the shadow for the teacher’s name and also for the word TEACHER so it would stand out more. I cut these out together and then used my contact paper again to transfer them onto the cup. You can use any size and font that will fit on your cup. I made the shadow on the teacher’s name 3 x 3. Then used 2.77 x 2.74 for the name. This is just what size it ended up when I made the shadow a 3 x 3. Again I used a shadow blackout rounded measuring a 10 since I thought it matched the font well. Now do the same starting with the white shadow teacher’s name and follow with the teacher’s name. Super easy but so special! 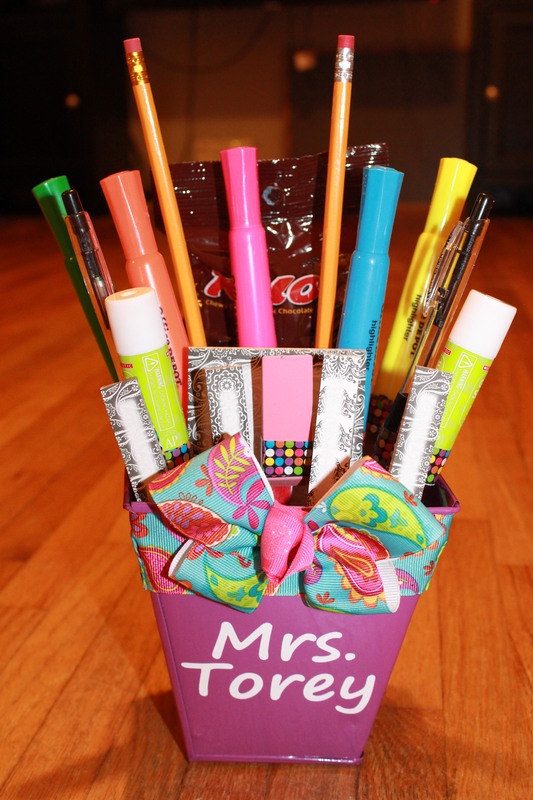 Fill it with candy and let your kiddos make a cute card! 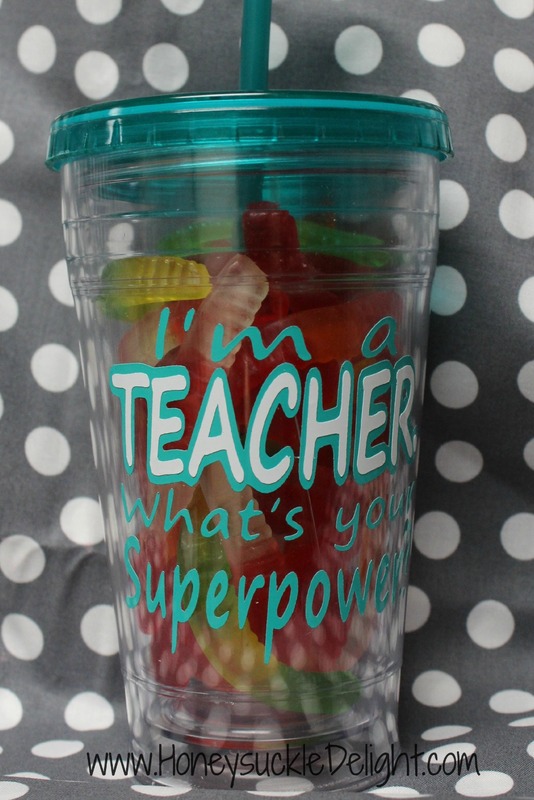 A perfect teacher gift! 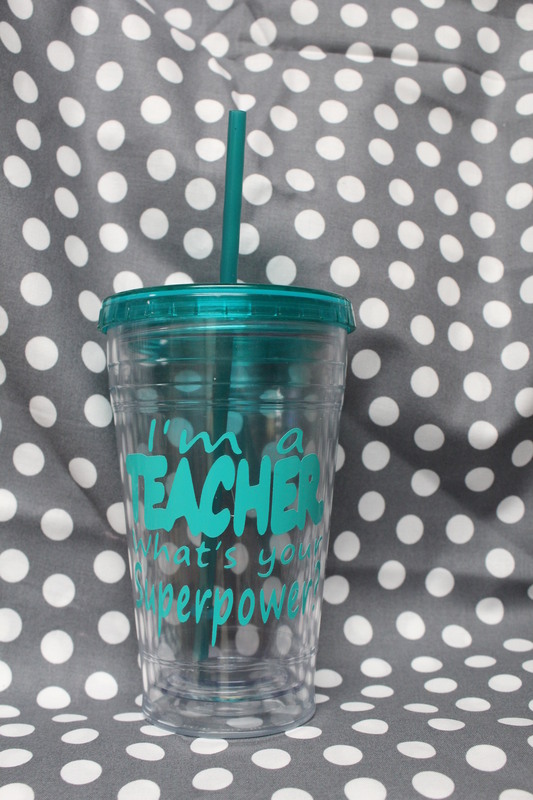 This entry was posted in Uncategorized and tagged Craft, Cricut, Gift, SCAL, Teacher, Teacher Appreciation, Teacher Gift, Tumbler, Vinyl.